under legislation that passed the U.S. House of Representatives today. The bill, sponsored by Reps. Cathy McMorris Rodgers and Dan Newhouse, R- Wash., would block spilling of additional water over the dams, which was recently ordered by the court to help young salmon and steelhead migrate to the ocean. Any modifications to the dams' operations would be halted for about five years, unless Congress specifically authorized changes to power production or Snake River navigation. House Resolution 3144 recognizes the dams' contribution to the Northwest economy and provides certainty to irrigators, barge operators and the region's electric ratepayers, the sponsors said during a conference call. Additional spills of water over the dams to aid fish costs about $40 million yearly in lost power production, which affects rates for families and businesses, Newhouse said. "Salmon and dams can co-exist," McMorris Rodgers said. "That's a story we need to continue to tell." Environmental groups, outfitters and commercial and sport fishing interests criticized the bill, calling it an effort to thwart salmon recovery efforts by replacing science with a political process. The legislation would overturn multiple court rulings on salmon, they said. Spilling water over dams during juvenile salmon and steelhead migration correlates to higher adult returns, said Joseph Bogaard, executive director of Save Our Wild Salmon. There's strong support among the region's fish biologists for the additional spills ordered by the court, he said. Bogaard said $40 million is a high estimate of forgone power production, but said the cost still works out to less than $1 per month for ratepayers. People don't have to choose between salmon recovery and low power costs, he said. Paul Fish, president of Mountain Gear in Spokane, was among 130 Northwest business owners who signed a letter to McMorris Rodgers opposing H.R. 3144. "Salmon and steelhead are important to our community," Fish said. "To legislate against good science and a court ruling seems like an end run around the way our system was made to work." In 2016, a federal judge in Portland tossed out the latest of five federal plans for restoring wild salmon and steelhead runs on the Columbia and Snake river systems. U.S. District Court Judge Michael H. Simon ordered federal agencies to prepare a new plan. 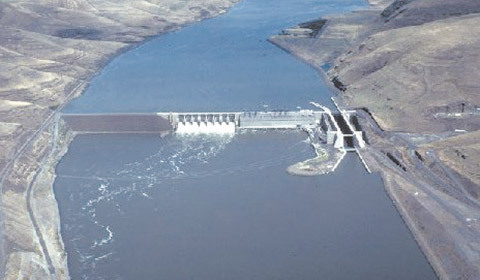 In his ruling, Simon wrote that the federal agencies had "done their utmost" to avoid considering breaching the Lower Snake dams, and suggested that a proper review under federal law could require analyzing the effect of breaching or bypassing one or more of the dams. McMorris Rodgers said her bill doesn't hamper the ongoing National Environmental Policy Act review of the dams' impact on salmon, or prevent federal agencies from conducting a cost-benefit analysis of removing the Lower Snake Dams. The legislation keeps the status quo until a new plan is issued, she said. Environmental groups, however, say they're concerned about a provision in the bill requiring congressional authority for actions or studies that would reduce power production at federal dams or limit Snake River navigation. The legislation passed the House on a vote of 225 to 189. The bill will head to the Senate for consideration, Newhouse said.